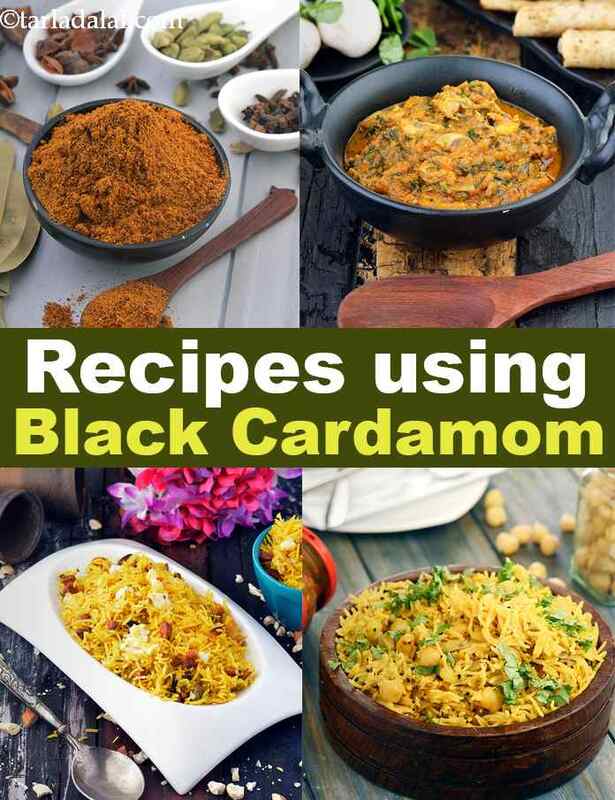 black cardamom Indian recipes. Also known as BADI elaichi. As a stark contrast from green cardamom, black cardamom is a whole spice that is much larger in size and not used in sweet recipes but instead used in savory recipes. They are roasted over an open flame and have a distinct smoky taste. Even though they are an aromatic, their aroma is not the same as the normal elaichi. The whole pod is used to add flavor to dals, subzis and rice dishes like biryani. Due to the very distinct flavor it has, Black cardamom has been used in savory recipes in India and many other parts of the world since many, many years. There are different ways to incorporate black cardamom in rice dishes. The most common way is to add it to the boiling water in which we cook the Biryani Rice. This lets rice absorb the flavor of the whole spices, making them more aromatic and flavorful. It can even be added to Achari Pulao to give it more of a kick. Black cardamom can be sautéed with vegetables and other whole spices to enhance its flavor before the rice is added to make Hyderabadi Sofiyani Biryani. The taste of the cardamom enriches the koftas added in the biryani. The simplest way to incorporate the taste and aroma of black cardamom would be to add Biryani Masala. This masala is made by roasting and grinding many whole spices together to form a perfect balance of flavors. Badi Elaichi is what gives many gravies the smoky, intense flavor that they have. My most favorite recipe that it is used in is Pindi Chole. The flavor of the Black Cardamom gets imbibed in the gravy very well. This is the reason for it being used so much in many basic gravy subzis like the Basic Malvani Gravy. It even perks up the unique combination in a Methi Mushrrom Subzi, giving it a super-rich mouth feel. Black cardamom forms a part of the basic masalas and which form a part of the common cooking in India. Street foods like dabeli use Dabeli Masala Powder, a semi dry masala made by dry roasting the while spices, grinding them up and mixing it with oil and sugar. Other than these, it is also a basic ingredient in other favorites like Pav bhaji Masala and Chole Masala Powder. Enjoy our black cardamom Indian recipes below. Lauki ke kofte, is the deep fried bottle gourd dumplings are simmered in a onion, tomato laden rich and spicy gravy. Enjoy the lauki or bottle gourd kofte ki curry with rotis and parathas. A delicious dal recipe, moong dal tadka is a simple recipe which can be used for every day cooking. A blend of tuar and moong dal is tempered tadka)with mustard and cumin seeds and flavored with tomatoes, onions, ginger garlic paste and jeera powder. Simply delicious, when served with steamed rice!